← Forgiveness of Human Rights Atrocities, Can We, Should We, Why? Arab Spring is Hit With Locusts; The Egyptian Baha’i Children and Youth are Banned from Attending School!! Egyptian Baha’i children are banned by their Muslim brotherhood government from attend school! So much for the hope of Arab Spring in dark ages! The Baha’is of Egypt have been subjected to persecution and systematic oppression. While their quest for equality has been finally heard by many of their fellow citizens, there remain challenges and obstacles to the implementation of laws intended to grant them their full civil rights and equal opportunity in their society. With the emergence of the new Egypt, they seek to be given the opportunity to actively engage in rebuilding their nation. Much has changed in Egypt, but much has stayed the same. 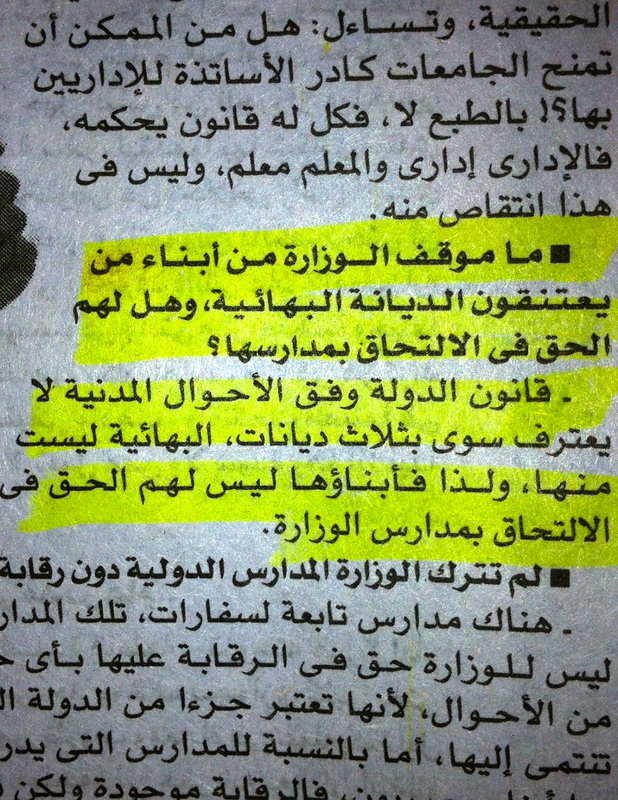 On November 30th Egyptian education minister Ibramim Ghanem gave an interview to the Egyptian newspaper al-Sabah. Amidst talks of Egypt’s changing education policy, one question affirmed the long standing legacy of marginalized minority religions such as the Baha’i faith across Egyptian society. What is the position of the ministry regarding the right of Baha’is to enroll their children [as Baha’is] in school? State law in accordance with government procedures only recognizes three religions, and the Baha’i faith is not among them. Thus their children do not have the right to register in government schools. This was the way governments used to operate in the dark ages before humanity woke up to the universal human rights for all. What is it with the Islamic world that has such a hard time in catching up with progress and realize that religion is only a medicine with a special purpose, to be the cause of progress and peace of humanity not to serve as the instrument of the ignorant and prejudiced who have shun the rising of the sun of oneness of all humanity, the oneness of God and the oneness of all God’s religion. I thought the civilized world came to a universal understanding that certain rights are universal human rights and not conditional upon what certain others believe or have a hard time to believe!! The problem of identification cards was the inspiration behind a satirical video that revealed the hypocrisy of Egypt’s reputation versus its reality. It is highly telling that the Egyptian policy of deep-rooted discrimination is reflected even these short lines from a casual interview. In order to truly reform in a more democratic direction, the Egyptian government must reform these laws that keep Egypt’s religious minorities on the margins. And the European Bank for Reconstruction and Development is granting Egypt a loan worth 1.25 billion euros next year… Should we grant loans to Government who don’t respect human rights ? What kind of Arab Spring is this? Egypt has a National Government or Muslim Brotherhood ? As long as the body politics is undermined by division and mistrust; the head is undermining the heart and the nervous system is in chaos, humanity is wasting its time thinking peace and tranquility, never mind spring, autumn or fall. We are living in ice age all together! Finally, where are those wonderful social media savy educated and liberated Egyptian youth who seemed full of hopes and dreams of progress and democracy? I hope they pick up the violations of the human rights of the Egyptian children as the death of their canary in the mine and poke a hole in the deadly status of their country so some fresh air might come in. This entry was posted in Questions and tagged Arab spring is blocking the sun, Arab spring is hit with locusts, Baha'i children of egypt, Baha'i children of egypt banned from school by Muslim brotherhood, Islamic Republic Regime lives in pre human rights era, Muslim Brotherhood. Bookmark the permalink.